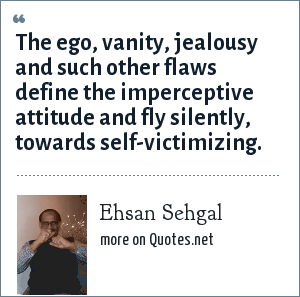 Ehsan Sehgal: The ego, vanity, jealousy and such other flaws define the imperceptive attitude and fly silently, towards self-victimizing. "Ehsan Sehgal Quotes." Quotes.net. STANDS4 LLC, 2019. Web. 24 Apr. 2019. <https://www.quotes.net/quote/73961>.